I first made lettuce soup when I was a teenager. A friend of mine happened to come around and visit whilst I was meddling in the kitchen and I gave her a spoonful of it to try. Whilst she was sampling that early example of my fledgling culinary artistry, I informed her that what she was eating was lettuce soup. I wasn't actually prepared for what came next. She thought I was weird. She ran across the kitchen squealing and spat it down the sink. Perhaps some people think that lettuce shouldn't be cooked? Why ever not? Lettuce soup has a lovely and unexpected, natural, creamy quality that when paired with lovage, a less commonly used herb that has hints of curry and celery, is perked up with a dash of intrigue and mystery. Lettuce soup. This one 'aint for spitting down the sink, believe me. - I finely chopped an onion and sauteed it in a knob of butter until it was soft and translucent. - I added what was probably about a pint and a half of homemade stock I'd made up from the carcass of that chicken and its uncooked extremities. - I simmered all the ingredients together just for 5 minutes. Then I added just five lovage leaves from White Crane Springs Ranch. Go easy on the lovage leaves. They are pungent. - Next I poured the soup into a blender. I was impatient and I didn't let it cool down enough so, even though I was holding down the lid, it managed to escape my grasp and next I knew, the kitchen, a new recipe book and I were all splattered with soup. Great. Some of it went in my eye. Pah. - I like my soups to be silky smooth, but because something I once read made a lasting impression, I prefer not to strain out all the goodness, so I simply blended it like crazy. - This soup works either hot or cold and I had a bowlful of it each way, but since I am the type of girl who drinks even water hot instead of cold, you'll undertsand why my preference is for the heated version more than the chilled. If you want more official, professional sounding instructions for making Lovage and Lettuce Soup, then check out the Mr Hugh Fearnly Whittingshall's recipe instead of mine. PS - The same friend who spat out the lettuce soup also heated up my gazpacho, another of my teenage experiments, in the microwave. there is also an old fashioned recipe for lettuce loaf, pain de laitue...its like a custardy lettuce slice..the georges blanc recipe pairs it with roast meats..it is spiced with nutmeg. of course..the key word is 'old fashioned'..the possibilities are endless with a little creativity! I think that I can remember that Lettuce soup, or at least a similar one and water-cress soup as well and they all tasted good. In fact the majority of the food you have made for us/me has tasted very good. Love. Jill was very taken with your card -and I likes it as well. How do you get the Mail to print those stamps!! I remember not liking that soup! Whether it was genuine dislike or the fact that my brian was telling me you didn't make soup from lettuce I don't know but I'd try it now. Sam, can you ask Fred what lovage is in French, so I can look for it in the market here? Lovely -- and perfect for Lettice and Lovage!! 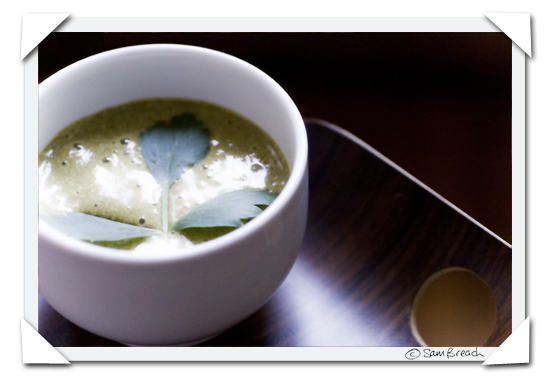 Wow, I lovage your soup. I lovage your photo too, all reflecty. Hah! Thanks for the acknowledgment of my weird, food-saving ways. Weird is best! Okay, call me crazy, but I take that "strained" stuff and put it in the freezer - save it for meatloafs and the like. Lovage doesn't get the respect it deserves! Thanks for the recipe. lettuce soup. somehow i just figured that was a myth, like rock soup. i think i might have to try a vegan-y version. FB - I forgot - what did beatrix say about the lettuce? I only remember flopsy mopsy and buttontail (or something like that) trying to steal them from Mr Mcgregor. Or not. Embee - you don't like soup! But you like the stamps, huh! Not sure you can have that done in the uk - but you can have it done here in AMerical. Beccy - I am sure Brian was right. Your head needs seeing too. When you next have a withered lettuce that has lain languishing too long in your fridge, make it into soup. yeah! Natasha - I just asked fred . He studied it and decided he didn't like it. But he doesn't know what it is in France - and I can't fault him because a few weeks ago I am sure I wouldn't have known it was lovage in English. It has a very strong lemony celery curryish smell and it looks like flat leaf parsley though a little paler in colour and each leaf with 3 distinct parts. Hope that helps. Look for that description in the market! I cvan still smell it on my fingers - it is strong! cookiecrumb - somehow I knew you would lovage this too. Karmyn - I have been known to do that too, for example when I made this extortionately expensive recipe I couldn't throw away the rejected pulp and it has helped make some extremely delicious lasagnas ever since. stephen - I am definitely planning on getting to know, know know it, is to love love lovage it. Sorry to spoil your day, Sam. A bad case of I lovage you so much I won't lettuce your blogs alone. Sam -- Think British stage, Peter Schaffer, with Maggie Smith --- "Lettice and Lovage" was an Eighties play. Sorry: my comment seemed too obvious to resist. I love when people cook with lettuce - it's still somehow so unexpected. When the lettuce is fresh and fragrant, it's balm for the senses. Lovely soup! A friend's Mother swears by boiling lettuces and drinking the broth to help fall asleep. Do this soup make you sleepy? Sam I well remember your lettuce soup and 'the incident' I also seem to remember there was rather a lot of it! names of their children; they were generally called the "Flopsy Bunnies." brother, Peter Rabbit, who kept a nursery garden. and an old boot or two. One day--oh joy!--there were a quantity of overgrown lettuces, which had "shot" into flower. slumber, and lay down in the mown grass. mowing machine. The blue-bottles buzzed about the wall, and a little old mouse picked over the rubbish among the jam pots. of the sleeping Flopsy Bunnies! Benjamin shrank down under his paper bag. The mouse hid in a jam pot. the lettuces had been so soporific. wild lettuce is supposed to be a hallucinogen..lettuce opium comes from garden lettuce and wild lettuce..in folk medicine, it is a kind of sedative and hypnotic. for obvious reasons, the results of whatever research that is done isnt very publicised. you cant trip on garden lettuce or even wild lettuce salad though...you need the milky white sap of the wild lettuce and you need lots of it..it might be an urban legend that lettuce makes you sleepy..or maybe beatrix potter was onto something! Sam, I love lettuce soup! I make mine with lettuce, onion and chicken stock. Plus Boursin (a brand of herb cheese). At first, I have to admit, I thought the idea rather strange, but my mother-in-law had a great recipe for it, I gave it a try, it was absolutely delicious, and it's been a firm favourite ever since.